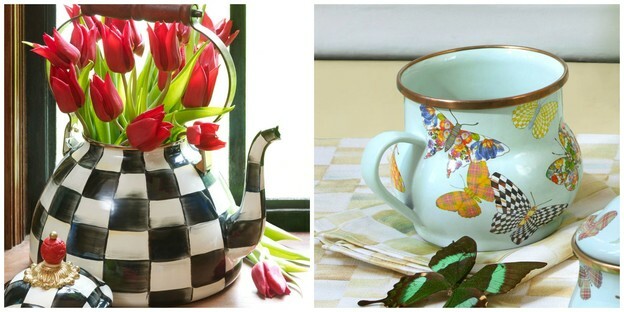 Tori’s Friday Favorites – MacKenzie-Childs Courtly Check Enamel Tea Kettle & Butterfly Garden-Sky Enamel Mugs. Comment to win! This week I’d like to announce a new feature on my website – Tori’s Friday Favorites! Once a week I’ll be sharing things that I find fun, beautiful, useful or interesting with all of you. Food and recipes are fabulous, but sometimes it’s nice to share other things too. I often stumble across new brands and products that inspire me. Friday seemed like the perfect day for chatting about all of this– we’re gearing up for a relaxing weekend, Shabbat is approaching, and all feels right with the world. Let’s dish about our Friday Favorites! I’m kicking off my very first Tori’s Friday Favorites with a giveaway from MacKenzie-Childs. When I first spotted their products on my friend Ree Drummond’s website I immediately fell in love. They’re unique, colorful, high quality items with a whimsical vintage flair that I just adore. Many of their items are handmade on a small farm in rural New York by a team of talented artisans, which means each product is one-of-a-kind. I knew I wanted to introduce this beautiful brand to you, and I’m thrilled to have the opportunity to host a giveaway of their lovely products. 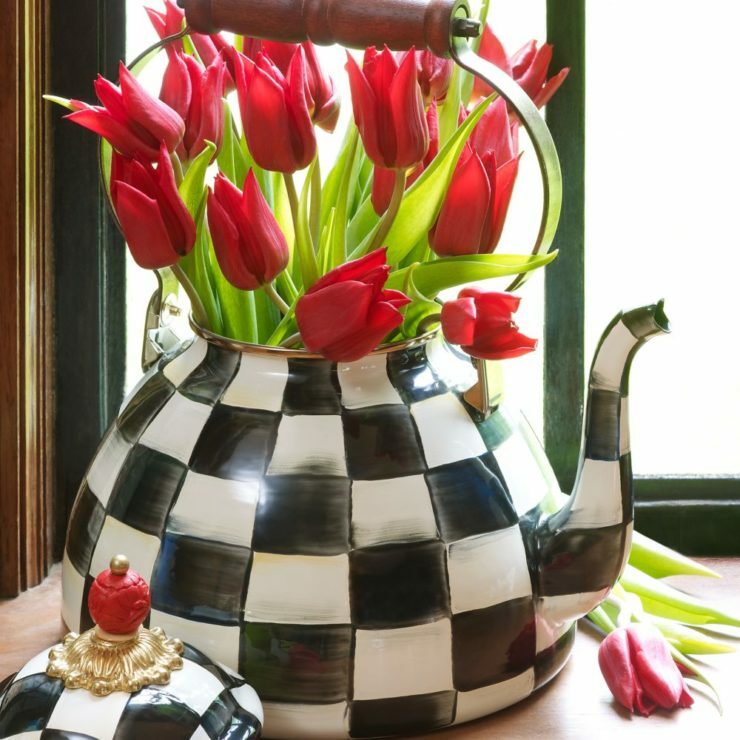 MacKenzie-Childs has generously shared their famous Courtly Check Enamel 2qt Tea Kettle along with two Butterfly Garden-Sky Enamel Mugs as a giveaway for one lucky reader (a prize valued at $176!). The kettle is made from heavy-gauge steel has been hand-painted, ceramic glazed and rimmed in bronzed stainless steel. There’s also an adorable wooden handle and the lid is topped with a beautifully carved bead. Of course this kettle can, and should, be used to make tea, but I love the idea of using it to display flowers, as shown in the photo above. Their enamel mugs are inspired by enamelware used by cowboys on the open range; the pretty butterflies are hand applied after the second glaze firing. The decals fuse to the base coat during the next firing, becoming a permanent layer in the design. Clearly a lot of thought and artistry goes into their designs, and it shows. For a chance to win this MacKenzie-Childs giveaway, simply comment on this post – one comment per reader. Want additional entries? Share this post on Facebook, Twitter, Pinterest, Instagram and/or Google + and let me know in the comments where you shared it. I’ll give you one additional entry per share! We will choose one winner at random for this prize on Friday, March 6. Winner will be notified via email, so please include a valid email address. This prize can be shipped anywhere, no matter where you live. Please Note: All entries will be subscribed to my free newsletter with free recipes and weekly post updates. If you are already subscribed, don’t worry, you won’t be subscribed again. You may unsubscribe at any time. Good luck! Follow MacKenzie-Childs on Facebook, Pinterest, Instagram and Twitter. CONTEST CLOSED. Congratulations to Miki Billian, who was chosen via a numeric randomizer. New giveaway coming soon, stay tuned! 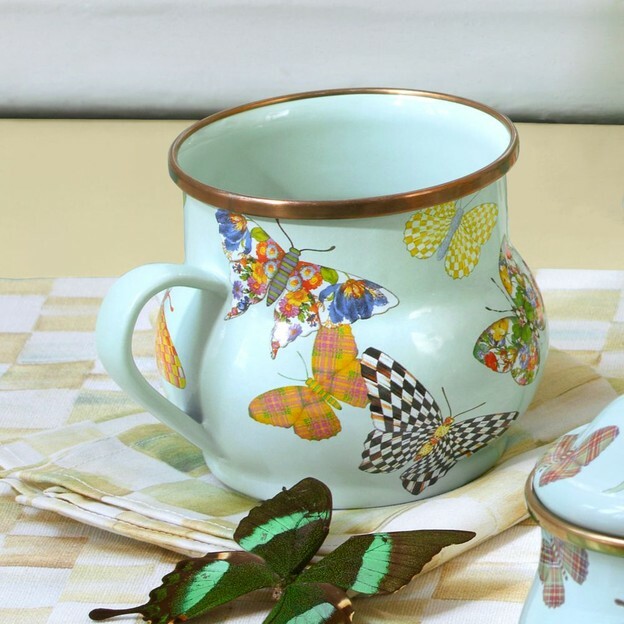 I love the enameled cups with all of the butterflies. A great lift-me-upper. I would just display them if I won. Love this! Thank you for opportunity. I soooo love MacKenzie-Childs. I am hoping to one day make it to their barn sale. I use their items as inspiration in my painting. I am sharing this on Pinterest. Love this giveaway. The pattern on the mugs is gorgeous. Love the teapot too! I really love this tea set. It reminds me of Alice In Wonderland and the tea party with the Mad Hatter. If I won I would have a Mad Hatter tea party with granddaughters and send in pictures of all of our fun. Love it. Shared it on FB and Pinterest. I have adored MacKenzie Childs for years! I would love this teapot and mugs. My 6 year old daughter and I would love to share our tea time with the beautiful butterflies! a beautiful set to raise my spirits on a cold and snowy day! It is so pretty! I love it! This is a great set. Would love to have it. Oh my word, this is absolutely gorgeous. I just recently started enjoying different types of tea and it would be more like a ritual if I could use a set this beautiful. Just discovered you by way of relish magazine insert in my local news paper today. I just purchased a slow cooker so you Slow Cooker Brisket recipe turned up with perfect timing and to top it off a chance to win one of a kind tea pot and cups it’s truly my lucky day! Love MacKenzie Childs dinnerware! Thanks for the chance to win these beautiful pieces! these are so beautiful…would love to have them in my kitchen !